“UNP leaders were generally upbeat and positive about their prospects in the upcoming election. 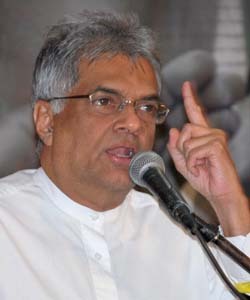 Party leaders, however, downplayed many of the significant hurdles to a UNF victory, including winning the support of Tamils and Muslims, unveiling a former military leader as the UNF’s presidential candidate, maintaining alliance unity, and mobilizing its supporters during a relatively short campaign season.” the US Embassy Colombo informed Washington. The Colombo Telegraph found the related leaked cable from WikiLeaks database, which details the meetings US Embassy has had with UNP leadership regarding General Fonseka’s presidential candidacy The cable is classified as “CONFIDENTIAL” and written by the Charge D’Affaires Valerie Fowler on November 25, 2009. Related news to the cable. Rajapaksas and the corruption associated with them. competitive candidate against President Rajapaksa. party feeling confident about the upcoming presidential race. polled even with President Rajapaksa. its broad electoral message after the recent U.S.
issue of the economy to campaign on the issue. support the alliance needed to win the presidency. independent as the UNF's presidential candidate. Fonseka if he veered too far away from any pre-election pact. presidency and ceding power to a executive prime minister. political party to back him. used to crack down on the opposition during the election. the political violence as well. that the pressure should be maintained. Tamil leaders and broader political reconciliation. supporters during a relatively short campaign season. the UNF to fracture before the next general election. Really? You have to read more closely to get the true picture.